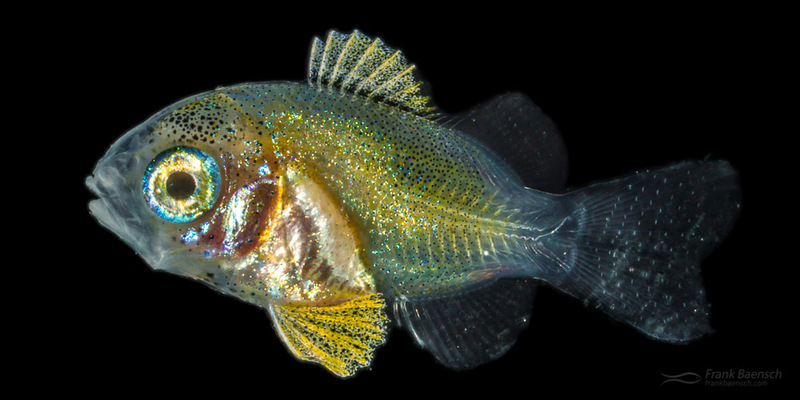 Hawaiian Sergeant damselfish (Abudefduf abdominalis) larvae were raised from wild-spawned eggs at 77-79F on wild copepods and artemia. The Hawaiian Sergeant damselfish (Abudefduf abdominalis) is a large, colorful damselfish, endemic to the Islands of Hawaii. A. abdominalis larvae were reared from collected eggs removed from nests in waters off the west side of Oahu in August, 2012. Adult Male Hawaiian Sergeant Damselfish (Abudefduf abdominalis) protecting its nest. A. abdominalis eggs are elliptical, adhesive, contain bright red yolk and measure 1.2 x 0.6 mm in size. The eggs hatch after 5-9 days, depending on water temperature. Features of A. abdominalis larvae include the early forming dorsal spines and pelvic rays; enlarged pelvic fins; yellowish body covered with small, black spots; and sudden changes in form and pigmentation with little growth. A. abdominalis larvae are easy to rear on copepods but, during the postflexion stage, they are somewhat sensitive to light and water circulation changes. The A. abdominalis larval period in culture was about 20 days. Sergeant damselfish (Abudefduf species) are inexpensive and potentially aggressive aquarium fish with limited value to the aquarium trade. However, the beauty, interesting behavior and short rearing phase of the larvae makes experimental breeding very worthwhile. First rearing of this genus dates way back to the 1970’s (Thresher, 1984).